Facebook has recently implemented a way for you to choose to get a notification (in your message area) whenever a favorite FB Page (such as the Surfnetkids Facebook Page or the JokesByKids Page) makes a post. 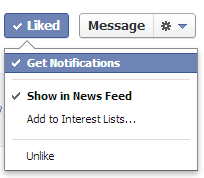 Choose “Notifications” in order to receive a message whenever a favorite Facebook page posts an update. Feldman, Barbara. "Tell Facebook Which Pages You Want to See More Of." Surfnetkids. Feldman Publishing. 20 Nov. 2012. Web. 22 Apr. 2019. <https://www.surfnetkids.com/tech/1977/tell-facebook-which-pages-you-want-to-see-more-of/ >. By Barbara J. Feldman. Originally published November 20, 2012. Last modified November 20, 2012.